In what’s seemed like the blink of an eye, August is nearly gone and the Fall season is coming quickly around the corner. This year’s offseason has been interesting and eventful giving us bloggers and basketball speculators plenty to talk about as the NBA new year gears up. With the changes that have taken place, there are three teams that I’m particularly interested in watching come October. The Boston Celtics as a relevant team this coming season is a foregone conclusion, but I’m still riding high on the success they saw last year. Brad Stevens dealt with what would have been an insurmountable combination of challenges for any other coach, turning lemons into the sweetest lemonade the organization has seen in years. The Celtics’ story last year is one that everyone can endear themselves to. Watching a group of young no-names push the envelope against the best players in the league is thrilling, and I can’t help wanting to see them achieve the success they’ve truly earned. The biggest variable this coming season will be watching how Gordon Hayward, and Kyrie Irving mesh in the lineup now that they’re healthy. Rookie Jayson Tatum had an incredible debut season putting him in the top three candidates for the coveted Rookie of the Year award. Being forced into a prominent role after Hayward’s injury provided him with incredibly valuable on-the-job training that will prove very useful for the Celtics as they make a push for the Finals this year. Guard Terry Rozier also stepped up in a big way when Irving went down with an injury, and nearly led his team to the NBA Finals. The Cinderella story would have almost perfect at that point, but as we all know, LeBron James pulled it off yet again sending the Celtics packing. Regardless, the Celtics now have a very capable and formidable guard to come off the bench and not just maintain, but actually make progress when Irving needs to take a rest. Perhaps the Celtics can even keep Irving healthy for the entire season by not having to rely on him so heavily. Long story longer, the Celtics will be a terrifying force to be reckoned with this coming season with a star-studded lineup, and quality depth for days. It seems as though the Raptors have had the makings of something special for years now, but they just haven’t been able to get things done in the post-season. I’ve had a hard time putting my finger on the crux of the problem, but it seems as though cycling through coaches has not been the answer to their woes. With the addition of Kawhi Leonard and his championship-level expertise this summer, the team may now be in a position to be a relevant player in the Eastern Conference beyond the bounds of the regular season. The Raptors took first place in the Eastern Conference last year in the midst of the Cleveland Cavaliers struggling to keep it together toward the end, and a late-season surge from the Philadephia 76ers. Unfortunately, the regular season rankings don’t matter in the post-season and in round 2 the Raptors flopped in epic fashion against King James in a sweep that left Head Coach Dwane Casey without a job. Perhaps the Raptors have just been lacking the “IT” man to be the one to push the team past mental and performance barriers because the collective talent of the roster has no reason to fall short of an Eastern Conference Finals appearance. Leonard brings the highest level of training and experience, and I’m interested to see if he’s truly the one that will transform the organization. He’s got a fresh start with a team to make his own so the proof will be in the pudding this year. I know, boring. But, come on you have to admit you’re a little excited to see how LeBron fares in Los Angeles. When James’ time in Cleveland came to an end this year I saw it as completely appropriate. I just couldn’t see the organization pulling things together for another Finals appearance. James brought so much to the city of Cleveland during his years with the team, and it would be a shame to see those memories tainted by not moving on when the time was right. It’s obvious that James has an itch to get just one more ring, and he wanted a clean slate to build yet another empire on. 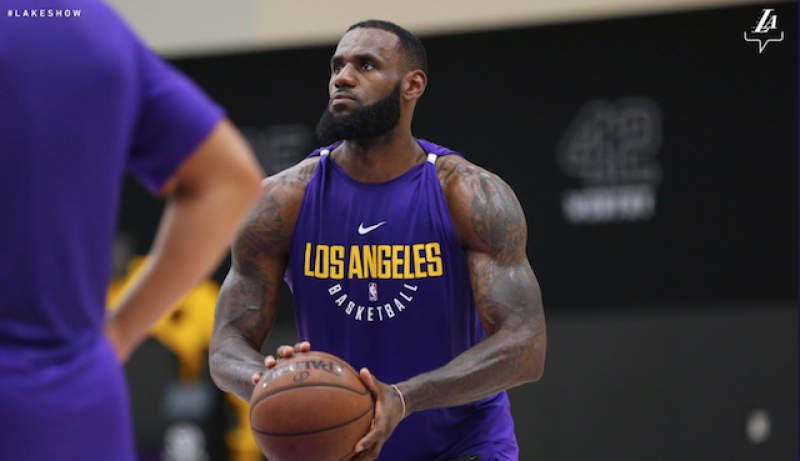 Partnering with basketball legend Magic Johnson will be an interesting collaboration as James has always had a say in the higher-level decisions his teams make. James is coming into an organization filled with young talent that is just waiting for the right leadership to take them to the next level. Rookie Kyle Kuzma shows to have what it takes to be a superstar talent in the league, and Lonzo Ball has promise (although the hype certainly out-lasted his rookie season performance). If James can pull this group together to take them all the way he certainly will have proved his nay-sayers wrong. We are still about 6 weeks away from the action, but those 6 weeks will be gone before we know it. Basketball season here we come!